The genial Perry Como graces the cover of this week's issue, sharing top billing with a man who in one year would be President-Elect of the United States. 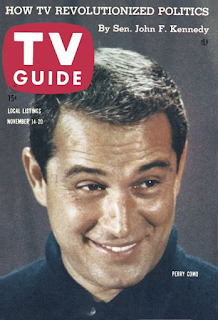 Perry Como had been a fixture on weekly television since 1947, and had had a Saturday night show on NBC since 1955. But as this week's feature story opens, the discussion is his move to Wednesday nights to host the network's Kraft Music Hall. Como doesn't view the move as a major change, although he allows that he's going to have to help sell a lot of cheese to justify Kraft's rumored $25 million investment in sponsorship, and he acknowledges that the competition (The Millionaire and I've Got a Secret on CBS, Hawaiian Eye on ABC) might be tougher than what he faced on Saturdays. More challenging, Como thinks, is how expensive it's become to put on a good variety show on TV. "They told me one show went up to $35,000 for one guest," he says, "And I thought that if you're going to pay $35,000 for a talent that used to cost you $1600, you're not going to be in business much longer." One advantage that the established Como has is that many of the biggest names -"Groucho, Bob Hope, Ginger Rogers" - want to do his show, which means he's less likely to have to outbid the competition. Even so, he acknowledges that "you've got to go for the dough" in the TV business, and that to remain successful a show has to find an angle, "something unusual. That's the ony way we can keep our heads above water." Como remained host of the Kraft Music Hall until 1967, so whatever it was he must have found it. 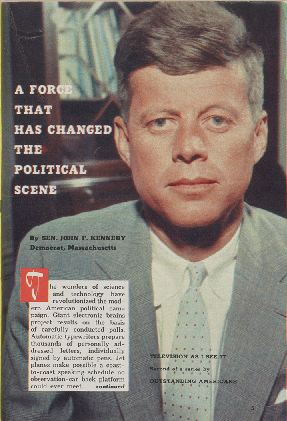 Television, according to Senator John F. Kennedy, is "[a] force that has changed the political scene," in the second article of the series "Television as I See It," written by "Outstanding Americans." In this case I wouldn't want to bet against Ted Sorenson having written it, but regardless of the authorship, there's no doubt that Kennedy understood how TV had already changed the political landscape, and the kind of role it would play in the following year's campaign. One obvious change is in the number of people a politican can reach at one time. Woodrow Wilson destroyed his health campaigning for the League of Nations, making 40 speeches in "three weeks of hard travel." By contrast, President Eisenhower "is able to reach several million in one 15-minute period without ever leaving his office." But it is the power of the televised image that may be the biggest change, JFK suggests. "Many new political reputations have been made on TV - and many old ones have been broken." He's probably talking about Joseph McCarthy as the "broken" reputation, but he might as well have been talking about himself as the the reputation made by TV. He'd first come to prominence at the 1956 Democratic National Convention, running a hard-fought (if eventually unsuccessful) campaign for the vice presidential nomination, but his youth and vigor was a hit on TV, and in the campaign against Richard Nixon he would use television to enormous advantage. In discussing the role of a candidate's image, which he acknowledges "may in fact be based only on a candidate's TV impression," Kennedy voices his conviction that "these images or impressions are likely to be uncannily correct." Would that Nixon had read these words. The quiz show scandals, which showed up in one of my This Week features from 1958, continue, as TV Guide relates the story of Steve Carlin, producer of the $64,000 Question and $64,000 Challenge. Back in 1956, when TVG had asked Carlin if the $64,000 Question "was rigged in any way," he replied, "Absolutely not. I will stake my entire reputation as a showman on this answer." His two shows, he insisted, were "completely honest." Contrast this with Carlin's testimony to a Congressional investigating committee at the end of October, where he admitted "the programs had been fixed." We're nearing the climax of the scandal now. Ironically, by the time this issue of TV Guide winds up in the home of the average viewer, Charles Van Doren has already admitted his guilt to the committee. He testified on November 2, which was likely after the publication deadline for the November 14 issue. We're nearing the holiday season - Thanksgiving is only 12 days away - and TV Guide is here to present you with the latest fashions, modeled by some of TV's lovliest leading ladies. From left to right on this three-page spread are Marjorie Lord (The Danny Thomas Show), Amanda Blake (Gunsmoke), Lola Albright (Peter Gunn), and Nanette Fabray (Caesar's Hour). Would TV stars do spreads like this anymore? For fashion magazines, I suppose. Better question - would it be rated G or NC17? 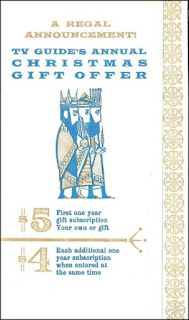 And speaking of Christmas, you want to make sure you get your order in for your TV Guide gift subscription. 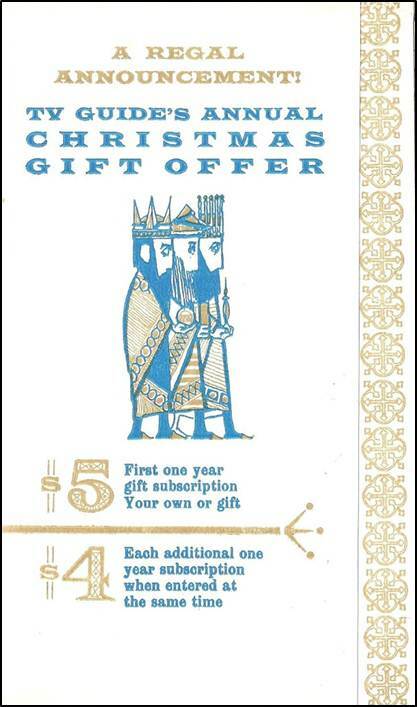 An excellent idea for Christmas - and it's only $5 for 52 issues, with each additional subscription for only $4. I just checked, and currently a TV Guide subscription runs $16.50 for one year, with no local content - not a whole lot of content period, for that matter. This is a savings of 92% off the cover price. Eh - I don't think so. So what's on TV this week? Some interesting things, in fact. Sunday gives us a couple of NFL games; most of CBS' Minnesota affiliates show the matchup between the Baltimore Colts, the defending NFL champions (who would repeat in 1959) and the Green Bay Packers, led by first-year head coach Vince Lombardi. Wonder whatever happened to that guy? The Mason City, IA affiliate however, chose the San Francisco 49ers, led by legendary QB Y.A. Tittle, taking on the Chicago Bears. NBC countered with NBA basketball: the Detroit Pistons vs. the New York "Knickerbockers." If you don't like any of that, there's always Roller Derby. I've commented a few times on how Hallmark Hall of Fame used to present quality plays before it became an outlet for Oprah-esque crap. You can always count on Hallmark to make an appearance whenever a holiday approaches, and this week is no exception, as an all-star cast of Julie Harris, Christopher Plummer, Hume Cronyn, Eileen Heckart and Jason Robards star in a 90-minute adaptation of Ibsen's A Doll's House. Brilliant, I imagine, but probably also depressing as hell. I've never cared for Ibsen; I like downbeat stories as much as the next guy, but I find him pretentious and nihilistic. 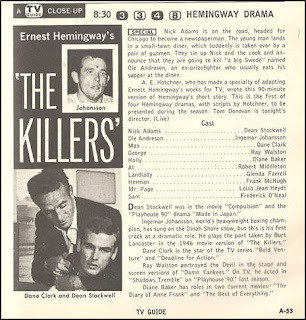 And that's not the best drama of the week: on Thursday, CBS presents an adaptation of Hemingway's The Killers, which was a terrific noir movie in 1946, starring Burt Lancaster, Ava Gardner and Edmund O'Brien. This adaptation, broadcast live, stars Dean Stockwell, Dane Clark, and Diane Baker. The real eye-raiser, though, is the casting of heavyweight boxing champion Ingemar Johansson in his TV dramatic debut as former boxer Ole Andreson, played in the movie by Lancaster. "Well, I cannot fight forever," Johansson said when asked if he was serious about acting. Hemingway was said to not like Johansson's performance, but Sports Illustrated thought he did pretty well. Talk about counter-programming - on opposite the brutal Killers was the equally brutal The Untouchables on ABC. In this week's episode the gangsters Dutch Schultz and "Mad Dog" Coll are involved in a ranson scheme, and it's up to Elliot Ness to stop them. And in one of those little tidbits I love to point out, "Mad Dog" Coll is played by Clu Gulager - who will be one of the stars in the 1964 remake of The Killers. Finally, probably the variety show of the week - NBC's Bell Telephone Hour salute to George Gershwin, with Ella Fitzgerald, Vic Damone, Polly Bergin, Marge and Gower Champion, Andre Previn and Teddy Wilson. That's a lineup even Ed Sullivan couldn't top. A last thought on this issue. I mentioned before that one year from this issue date, John F. Kennedy would be President-Elect. Four years from this issue date, he would be dead. And Perry Como, who was concerned about the survival of his show, would continue for almost eight years, until 1967. I'm willing to wager that on November 14, 1959, nobody could possibly have imagined it all. And one final note: each week, I post selected selected listings from my "This Week in TV Guide" issue at Radio-Info's Classic TV message board, one of my favorite spots for fun and intelligent TV discussion. This gives you a chance to dig behind the big stories and see the shows that TV offered, hour by hour. Some of them are unremarkable, others unbelievable - but all of them interesting! Very entertaining post! Wow, that's a pretty terrific Hallmark cast: Julie Harris, Christopher Plummer, Hume Cronyn, Eileen Heckart and Jason Robards. These days, it's Jennie Garth and Tom Arnold. 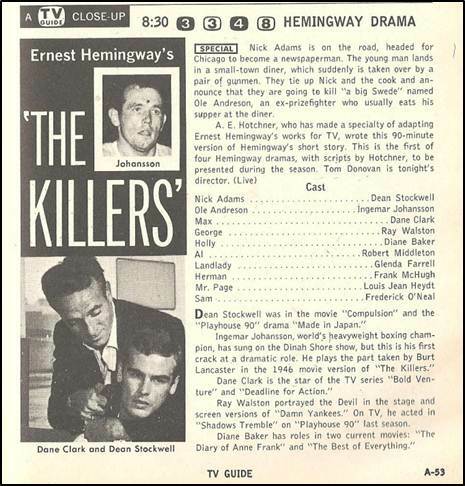 As for THE KILLERS, what's interesting is that the 1964 remake with Ronald Reagan and Lee Marvin was made for television, but deemed too violent and released theatrically. Thanks for the kind words! Back at ya on your blog! You're right on both counts - it often pains me to see the powerhouse products that HOF used to put out, as opposed to the sentimental claptrap they have now. On The Killers - I really do like the 1964 version; I think Marvin's character is fascinating (as so many of his are). Compared to what we see on TV today, it's hard to believe they thought it was that violent. But, as I'm fond of saying, you always have to look at things in context, and for that day it would have been seen quite differently.